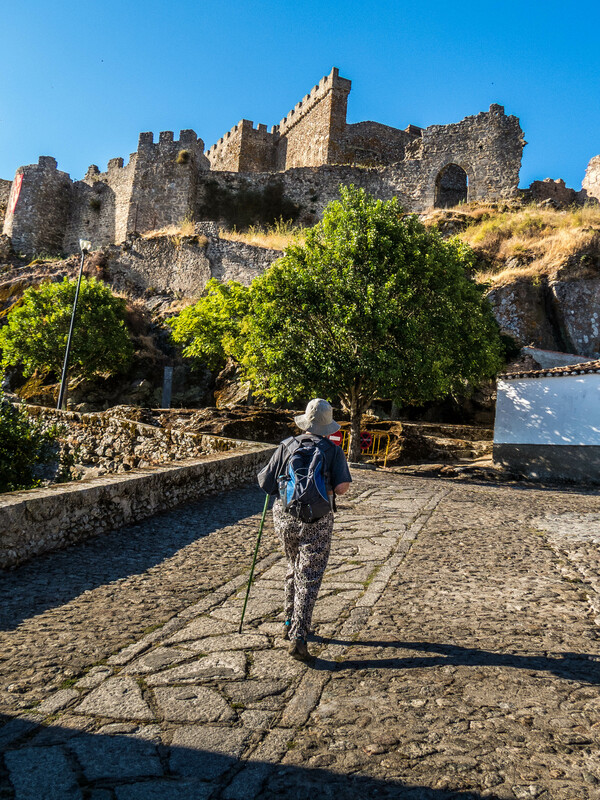 Walk through the centuries on Moorish and Roman paths in the beautiful Sierra da Montanchez, Extremadura, Spain. Walking these paths is a very special experience, the wild parts of the sierra are rich with wild flowers and herbs, amazing bird life, especially birds of prey. 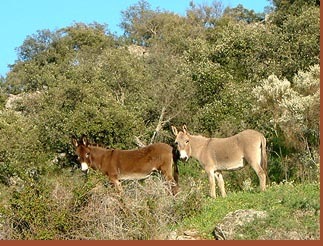 Visit www.wild-spain.com for marvellous information. The carefully tended orchards and vineyards are a delight to see, all protected by stone walls and ingenious iron gates made from old farming implements, even old beds are integrated . At the end of the day the gates are firmly closed , the farmer hops on his donkey and heads back to Montanchez. Our walks can be accompanied by either one or both of our own donkeys, Ferrari and Billy, they will carry any baggage and the lunch time picnic, maybe even a walker, if necessary. Here is a description of one of our walks. Arroyomolinos is the nearest village to Finca Al-manzil and can be reached by a delightful path directly from the finca. The village is very peaceful and claims to be the largest producer of figs in the Extremadura. There is a 15th century church with a marvellously intricate stone entrance. The battle of Arroyomolinos was a decisive battle in the Peninsula Wars and was fought on the plains outside the village where the figs now flourish. 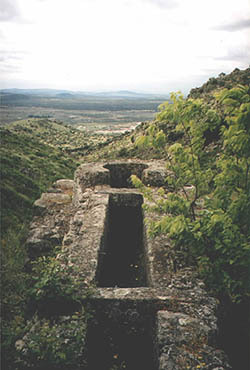 Arroyomolinos means "Stream of mills" and it is this feature that we will discover on our walk. 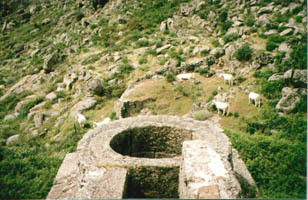 The village is backed by the slopes of the Sierra de Montanchez, a deep gorge has been cut through the sierra by a strong stream and it is here that water mills have been built since Roman times. Throughout the following centuries the mills were consructed to the same curious design. The water was guided by stone water chutes into tall chimney-like towers, then came crashing down to drive the mill stones at the bottom, the water then continuing down the gorge to the next mill. It is an impressive sight to see the mills marching up the gorge as we walk along the stone-paved path. 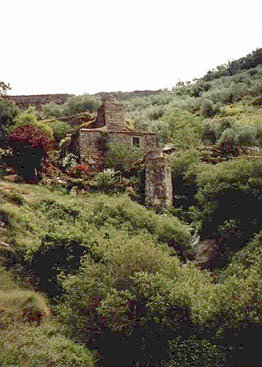 As this is the only access to this wild gorge the mills were gradually abandoned in modern times and most of them are now picturesque ruins, although a few have been renovated. The walk winds up the gorge along the side of the stream, past the olive groves and orchards which are watered by the stream. Here there are olives, figs, oranges, lemons, huge mulberry trees and vines that produce the strong mountain wine Pitarra. The small, black Iberic pigs that produce the delicious jamon are left to range freely under the cork oak trees gorging on the acorns. In Spring the whole mountain becomes a tapestry of wild flowers including rare orchids and many aromatic herbs. Usually walks in the sierra are accompanied by the cry of the eagles circling above. 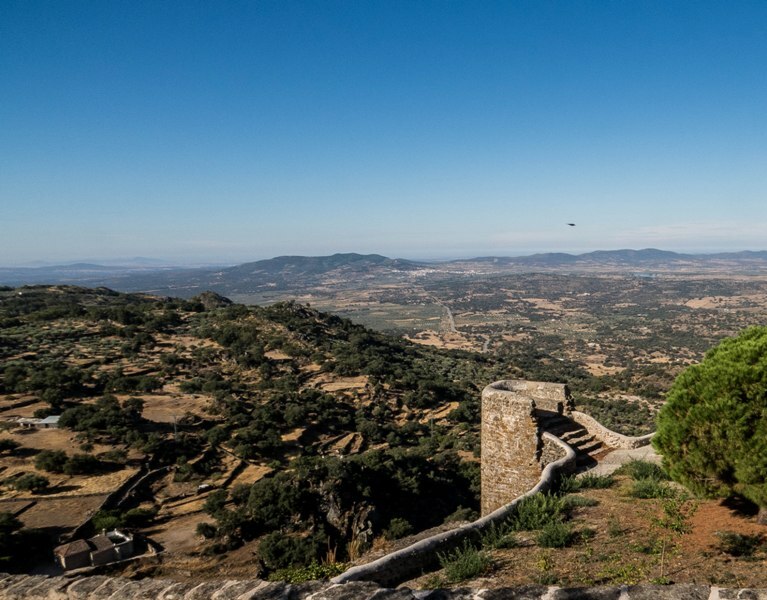 When one reaches the top of the gorge there are spectacular views in all directions, down towards Arroyomolinos and Sierra Cornalvo in the distance and in the other direction towards Montanchez with its Moorish castle perched on a formidable peak. 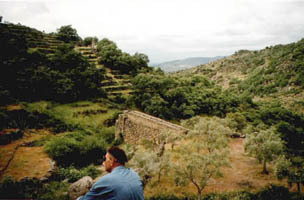 The path winds around the sierra eventually ending up inside the ramparts of the castle where we realize why Montanchez is called "the balcony of the Extremadura".